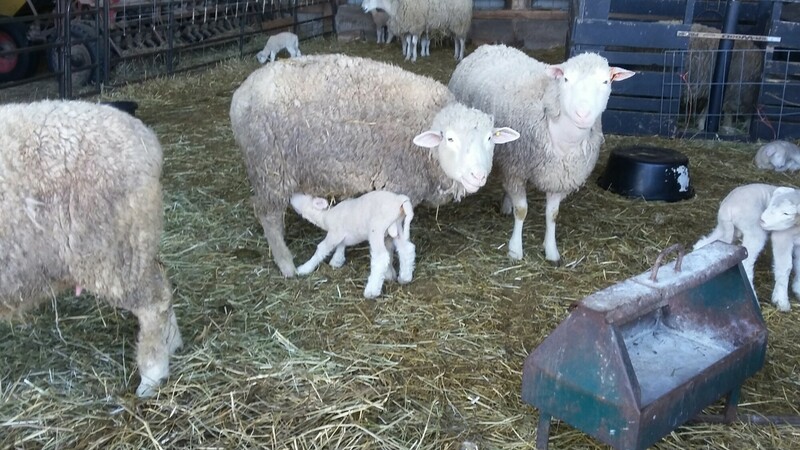 It’s lambing season out at Alder Creek Farm and this little girl is 5 minutes old. 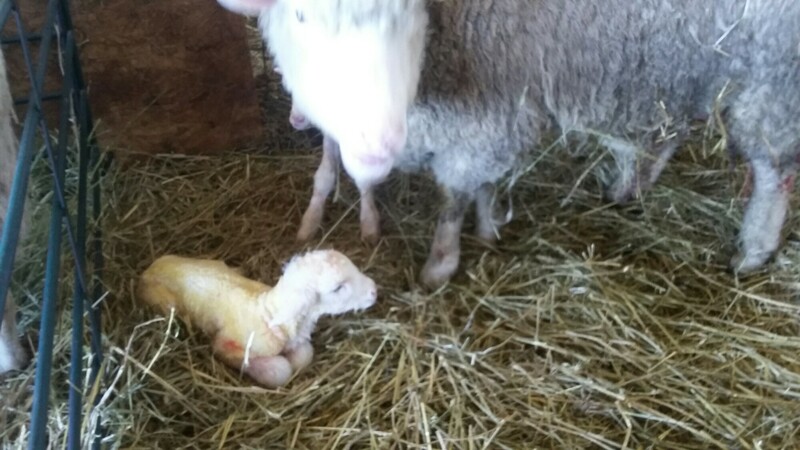 Sadly I missed the birth of her and her twin as I drove up the laneway but is was a pretty cool experience none-the-less. Kim and Gary have a mixed flock, mostly Dorset and Cheviot with some Romney and a few Shetland. The gestation period is a little more than 150 days and today at about day 157, these ladies are ready to pop! 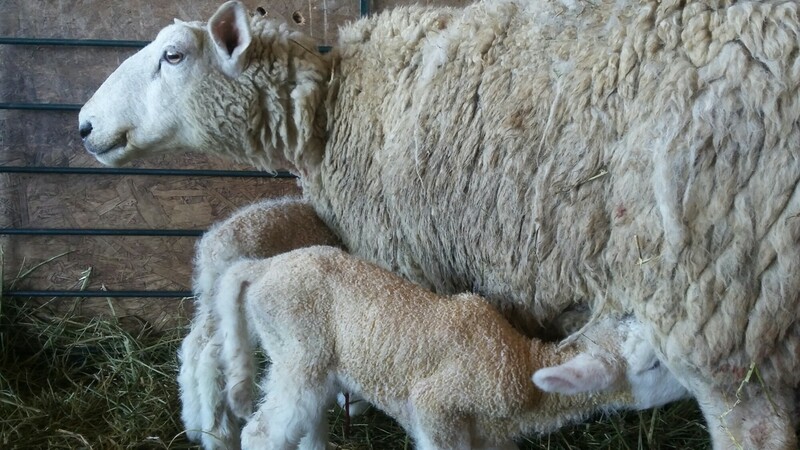 Over the past few days there have been about 18 births, more twins than expected, and they are expecting another 25 or so shortly. They have their hands full. It’s hard not to instantly fall in love with these critters. 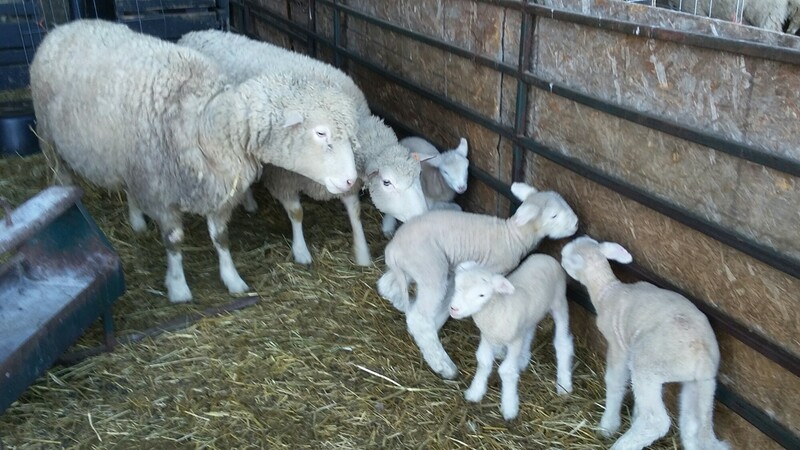 The ones in the picture above are about 5 days old and growing cuter and more lamby every day. Having been a customer of Alder Creek since I moved here 4 years ago, I am completely aware that these animals are being raised to become food, perhaps my food. I’m ok with that. 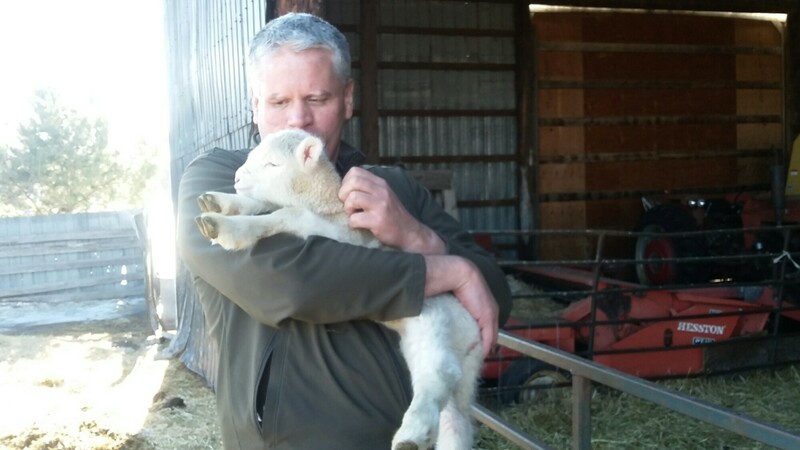 In fact it makes me happy to know that these lambs have a great life living on a farm that I’d like to live on, given the chance, and grazing in a pasture outdoors that’s second to none. They even get to escape from time to time and be mischievous when they find a hole in the fence. Much better than any of that factory farmed meat that is ubiquitous. I asked if they gave any warning when they were about to give birth and kim said that she knows somethings up if they don’t eat. Apparently nothing puts a ewe off her feed except impending labour. It seems these ladies aren’t quite ready to deliver. 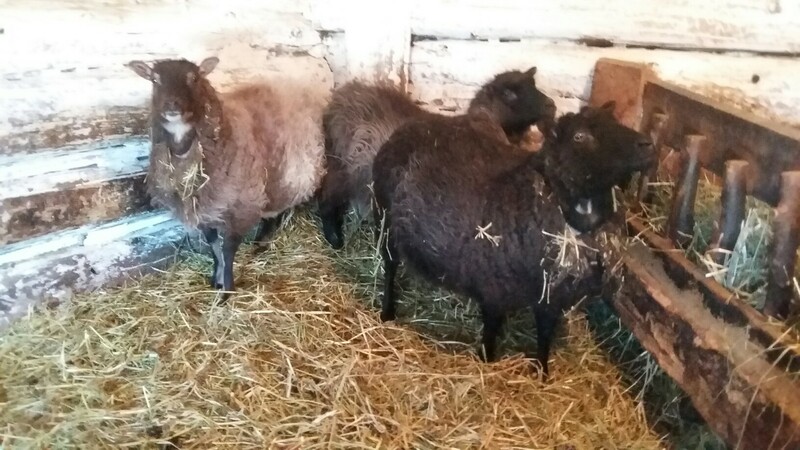 These are the Shetland sheep. 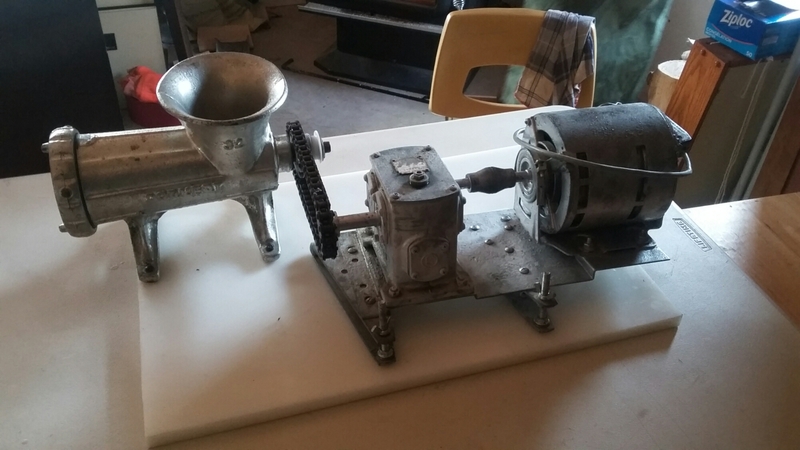 It never ceases to amaze me what one can find on kijiji! 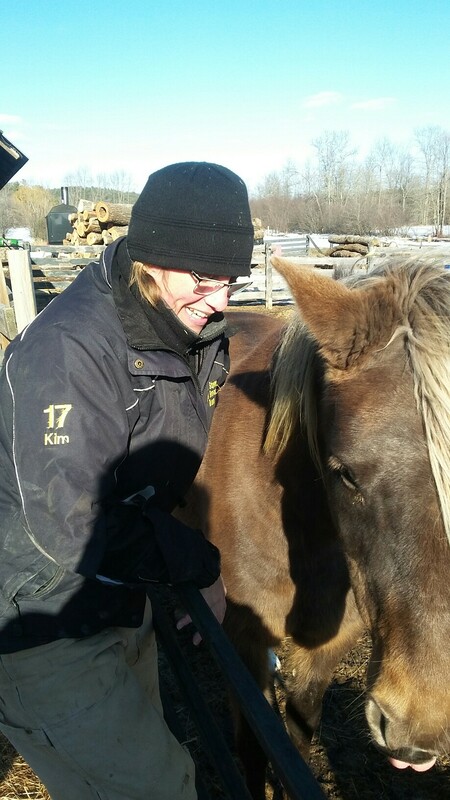 Kim’s still getting to know them so they are off in a different barn. I called dibbs on the wool when they are shorn. Who knows what adventures that might ĺead to. Happy farmers. Happy critters. Happy life. 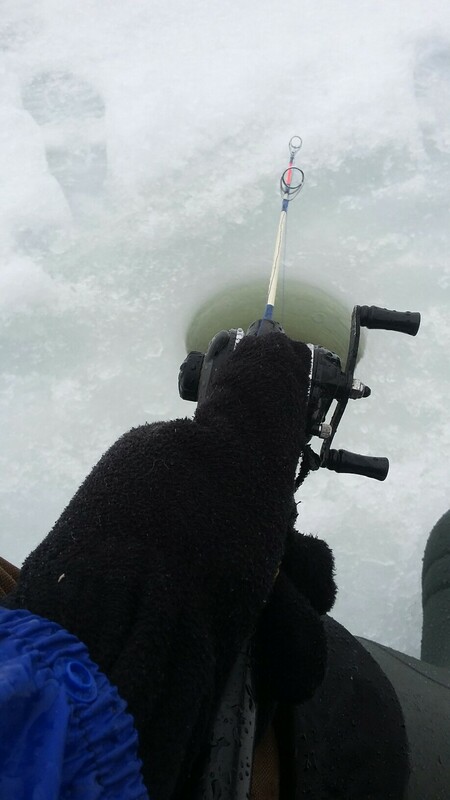 My fishing buddy, Barry and I have been threatening to go ice fishing since it first turned cold. 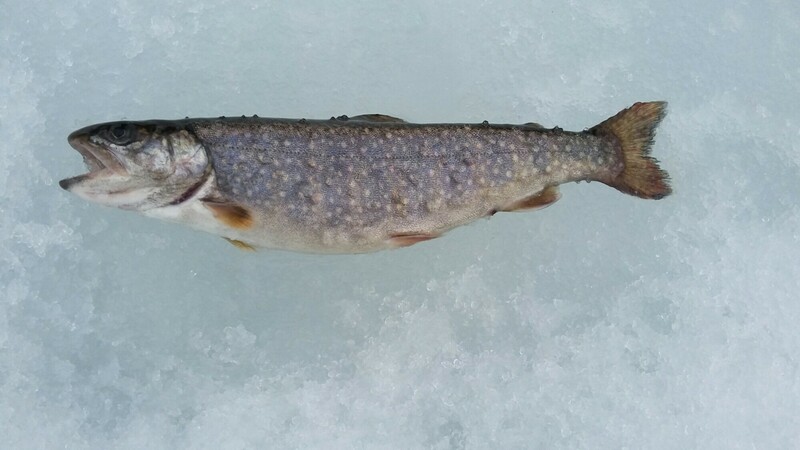 Being a transplanted city boy I’ve never had the opportunity to ice fish and I’ve always wanted to give it a try. January was busy. In February it rained and we lost the ice. Earlier this month there were colds and commitments and work to deal with. Sadly it never rose to the top of the list. 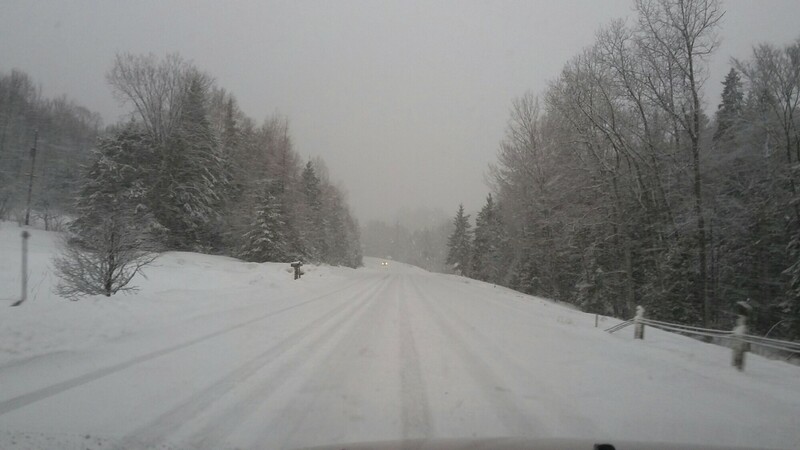 With spring having arrived earlier in the week along with the return of winter temperatures and ice, we decided it was either now or next year. Now seemed like the better choice so we both ditched work for the afternoon and hit the lake. 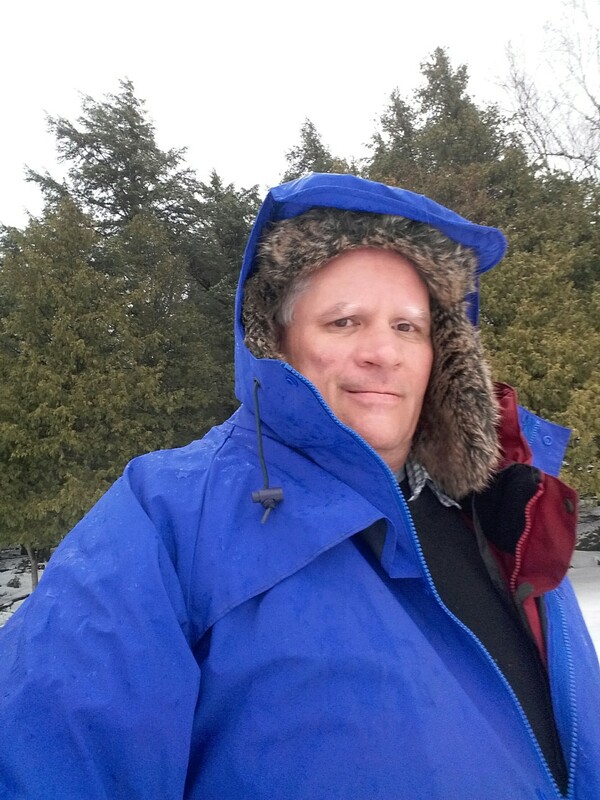 The appearance of snow, freezing rain, ice pellets, and pouring rain dared us to turn around and go home but instead I just put my rain coat over my parka and dropped my line through the hole in the ice. And I waited. And jigged. And waited. We were after trout and we only caught a couple. They were on the small side. Barry felt bad that we didn’t catch more, thinking that he had failed me as a fish whisperer. 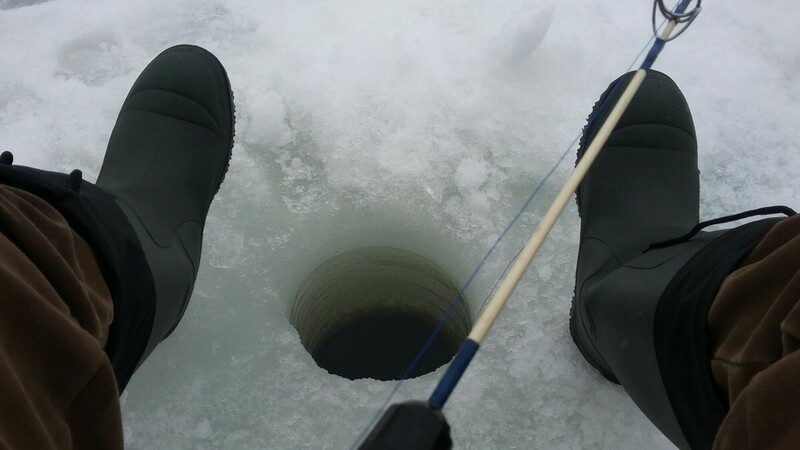 I was over-the-top pleased that I had finally made it out fishing before the ice disappeared and I missed yet another year. For me it was about the process not the outcome. And the process was awesome. Big warm boots. 4 layers of clothes. 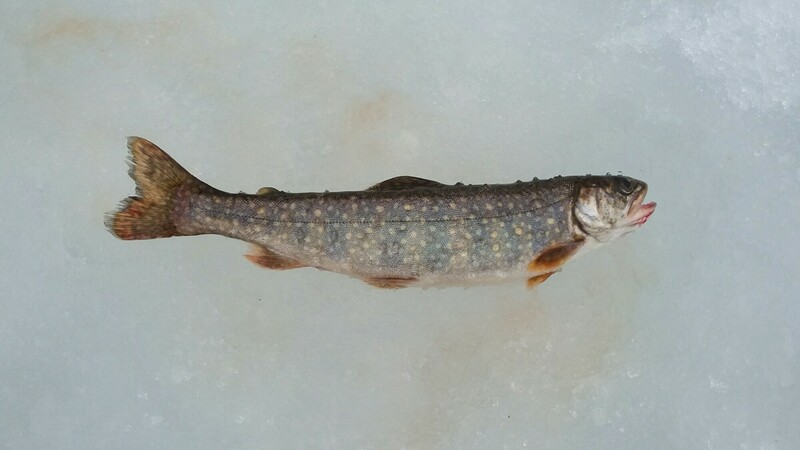 A couple of hooks baited with minnows dangled through the ice trying to tempt the fish. From my perspective it could hardly have been better, fish or no fish. Despite his insistence I let him keep the catch this time. 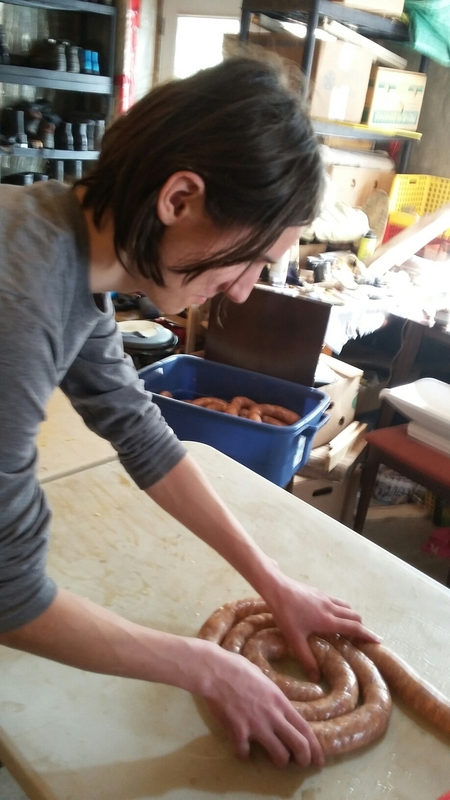 I also left him and his family with 2 different kinds of my home made sausages to thank him for his ongoing efforts to get me out on the lake. And the local wisdom, according to Barry: ‘fishing and catching are 2 different things.’ True enough, but that won’t deter me from taking every opprtunity to fish that comes way. For me, its all about the process. 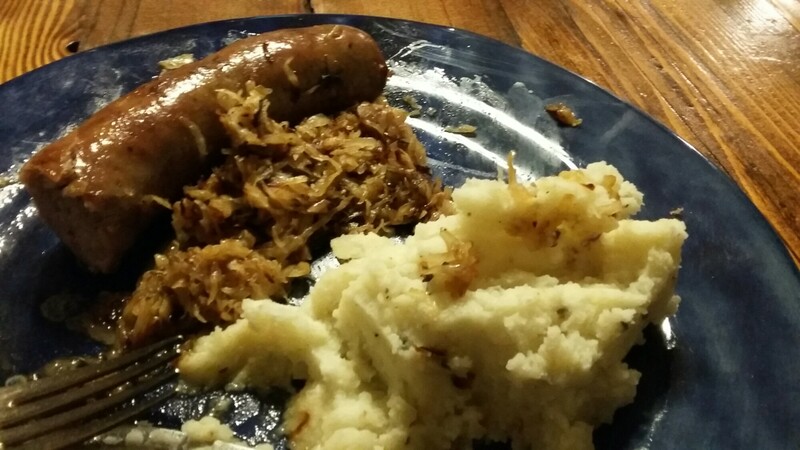 Smoked sausage, sauerkraut, and mashed potatoes. Renfrew County Gold. I left half of the sausages from last week with Mario, about 10 kg. On the advice of our expert / co-conspirator, we planned to smoke them in Mario’s make-shift smoker for a day. The temporary smoker is made out of some cedar planks and vapour barrier. It works brilliantly and it’s a good stand-in until he has time to build a more permanent smoke-house this summer. 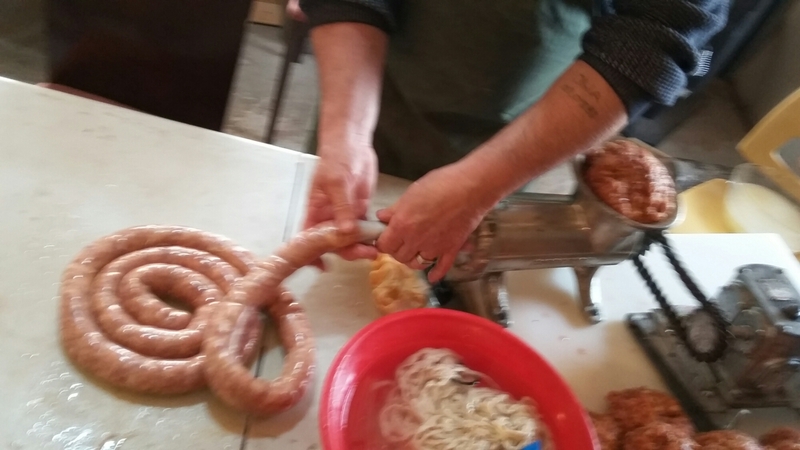 Today he delivered the sausages and I’m eating my first ones as I write this post. They are amazingly good. I wasn’t sure how I’d like the smoke but I’m a big fan. I currently have about 25 kg or so of various pig parts including a LOT of bacon sitting in a brine, waiting to hit the smoker. About 10 days in brine followed by 4 or 5 days in the smoker will make a whole pile of goodness that will get hung from the copper pipes in my basement for a couple of months before I eat them. So good. Life is good. Among other things, I washed out and cleaned up my sap buckets today in preparation for the tapping of the trees tomorrow. Fun fun. More adventure awaits. The other white meat?? Not if it’s real pork! It’s been bitter effing cold for the past week or so. On Sunday they said it was going to be minus 20 but it would feel like minus 32 with the wind chill. And it seems like it’s been that way for a month now (but I have a bad memory for these things). This evening it warmed up so it could snow. A balmy minus 12 and blustery. 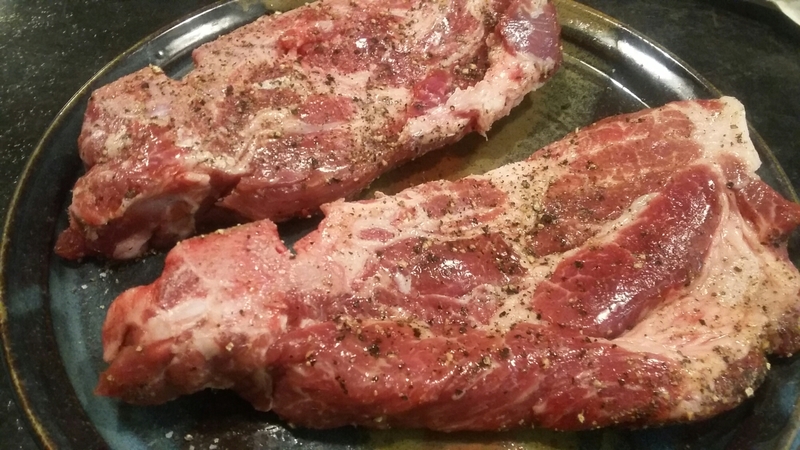 I had set aside a couple of shoulder chops from the pig for just the right moment and I decided this was it. 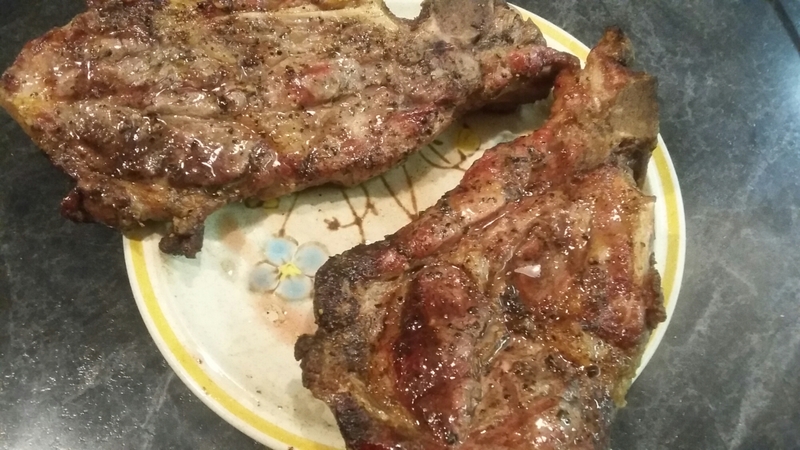 I fired up the bbq and stood outside in the blowing snow to grill these chops to perfection. The first bbq in months. 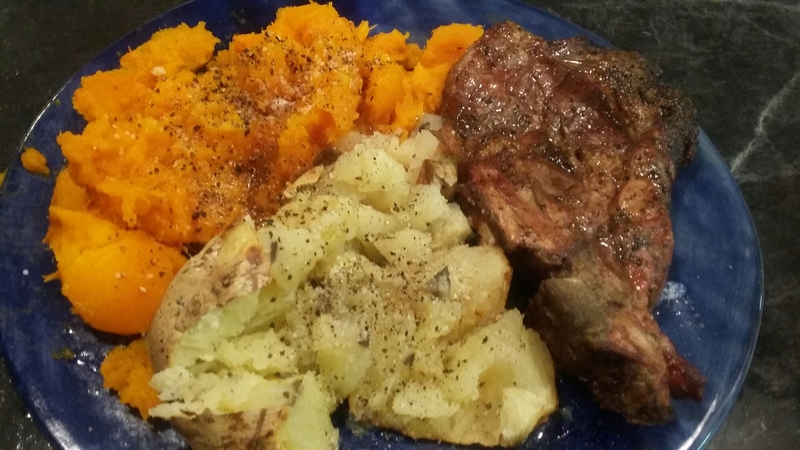 Served with squash and baked potato, both from Blakeney and Jackson’s homestead in Rockingham and topped with my homemade yogurt from local milk. A local meal in the middle of March. Nothing could be better. On making friends and keeping New Years resolutions. A few weeks ago I went to their place for a meal, my first. 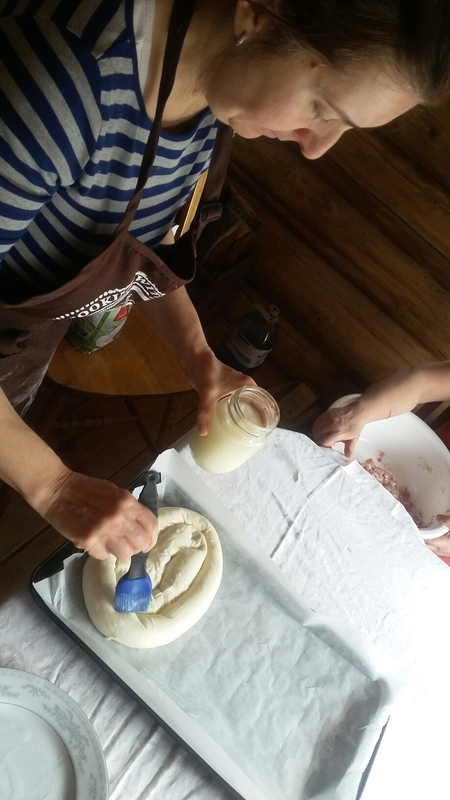 She is an amazing cook and we had cabbage rolls that that were baked on top of a bed of smoked pig parts – ribs, sausages, bacon, hocks. So good – an amped-up Croatian take on chacroute garni, sort of. During lunch I told them about my New Years resolution to learn how to make strudel. Strudel has always kind of intimidated me but it’s never fallen off the to-do list. I prefer to make resolutions that excite me (making strudel) rather than those that sound like punishment (going to the gym 10 times a week!). Valentina said that her friend Jelena would be visiting in a few weeks and that Jelena would teach both of us. Another perfect Killaloe coincidence. This story gets better. Way better! I bumped into Mario in the diner last week and he asked me if I wanted to get in on a deal. 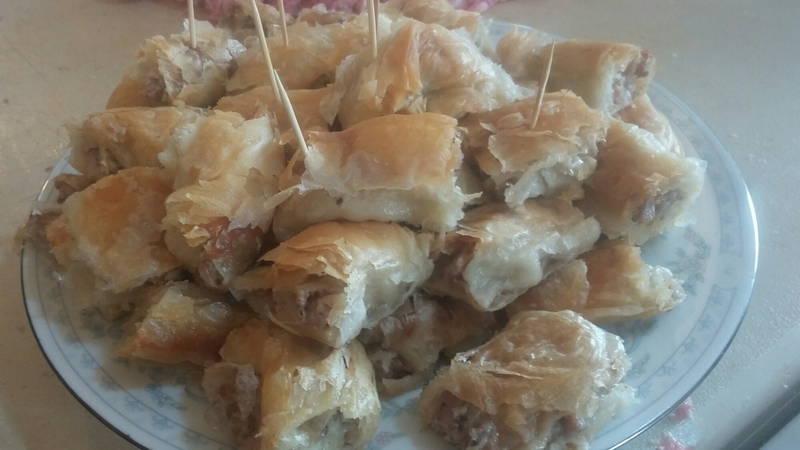 Their friends (the strudel-making Jelena and her Yugoslavian butcher husband Goran) were planning to visit. Mario invited me join them for a pig and pastry extravaganza. I was in. 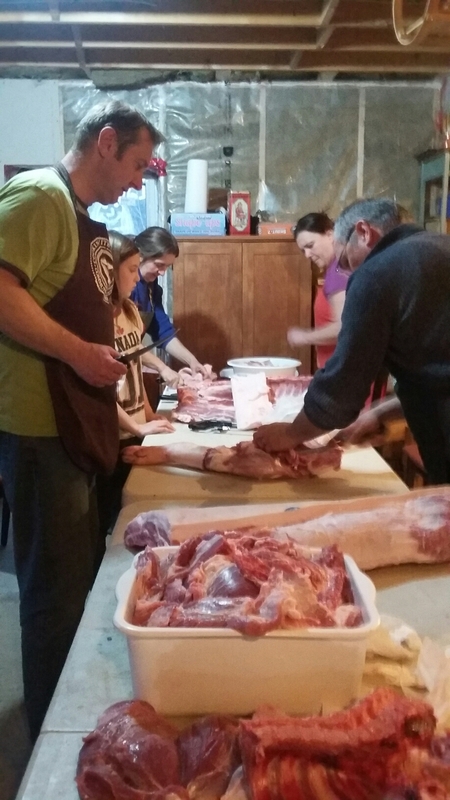 Mario picked up 3 naturally raised and freshly slaughtered Mennonite pigs (600 pounds in all) from the abattoire on Friday afternoon and we all gathered around the table in their basement to butcher and process them. After 7 hours on Friday evening and another 11 hours on Saturday we had finished the bulk of the initial work. My take was 45 pounds of sausages, 15 pounds of stew meat, 15 pounds of yummy shoulder chops and nearly 20 pounds of ground meat. Tenderloins, loins, ribs, belly,head, skin and all manner of other bits are waiting to be dealt with. Lots of it is getting cured and will end up in the smoker for a week and I have lots of plans for further processing throughout the week (lard, head cheese, wieners…). It was amazing to work along side a European butcher and it was truly a family affair with all three kids getting involved.. So many tips and new approaches that I will incorporate into my piggy-loving future. The pastry lesson came mid-day on Saturday. 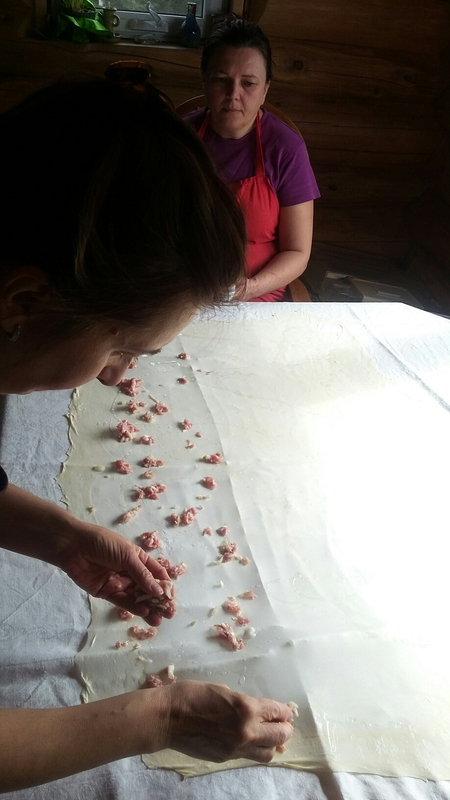 We actually were making borek which is a meat-filled phyllo pastry that dates back to the Ottoman Empire -apparently a different Turkish delight:). The method is the same as strudel. 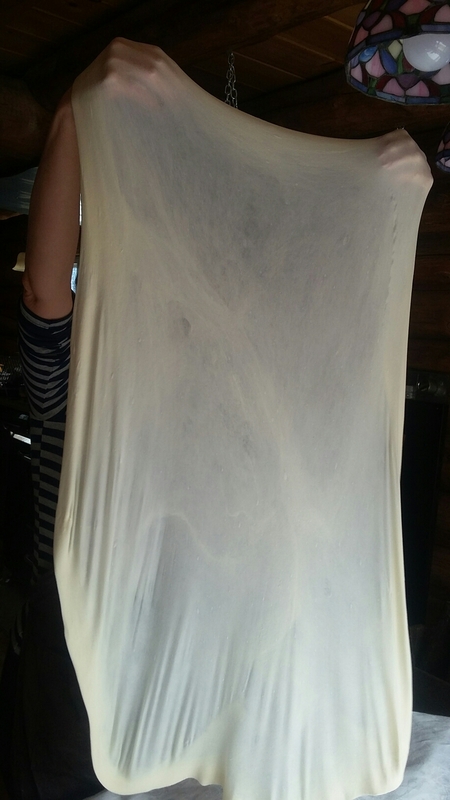 We made a soft dough with flour, salt, and water and kneaded it for a long time to develop the gluten so that it was strong enough to stretch. 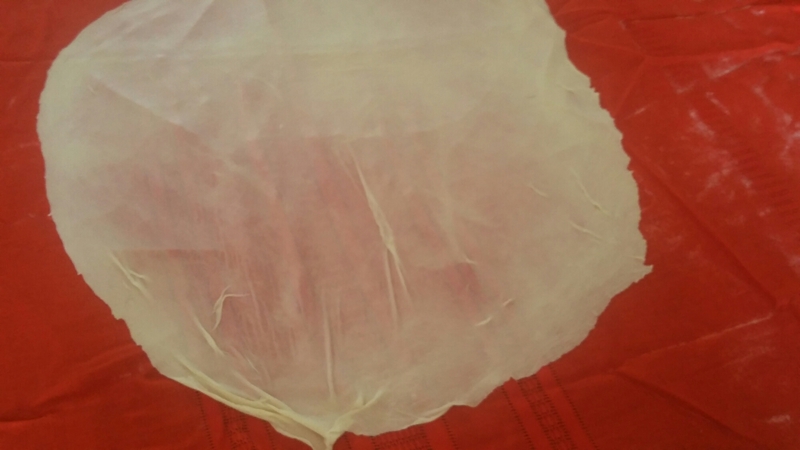 Then we rolled it out and gently stretched it until it was paper thin. 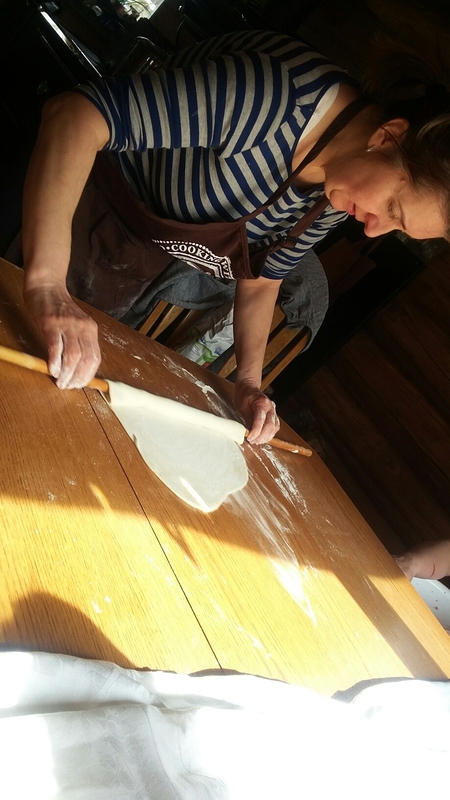 In La Varenne Practique, Anne Willan says that you should be able to read a love letter through the finished sheet of pastry 🙂 I expect I’ll get lots of love letters when I master this skill. She sprinkled it lightly with lard and then put wee bits ground pork mixed with sautéed onion on top. It was gently rolled into a loose tube, turned into a coil, brushed with more lard and baked in a hot oven. Brilliant. It’s a skill I will need to practise a lot. I’ve set an intention to make it every Sunday until I can turn out a good product. 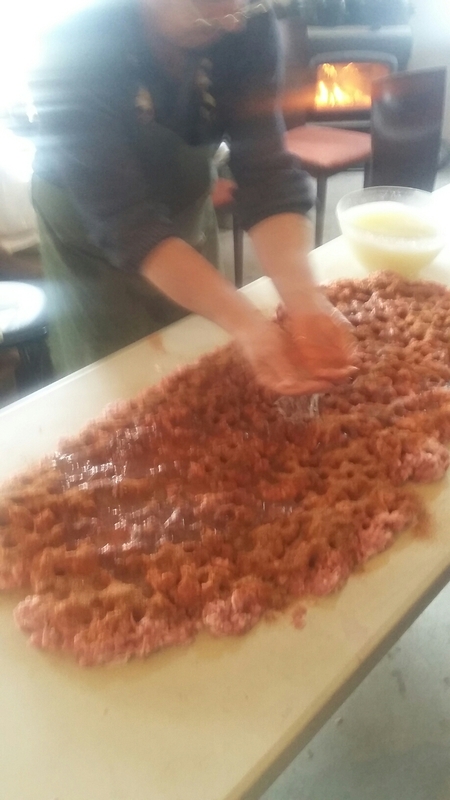 True to my word, I woke up early on Sunday and started the process while I was rendering lard, making scrunchions, making stock, and vacuum sealing pig portions in the background. . The pic above on the red sheet it my first attempt and it was pretty good and pretty thin. More practise is required for sure. I got lots of encouragement this morning at work to keep trying and trying 🙂 They promissed to continue to be my taste testers as long as I need to practise. The word for the week is Zivjeli. Sounds like ‘Giggly’ with a v instead of the gg’s. And it means cheers in Croatian. Zivjeli!.